Join one of our popular English Courses in Malta! AClass Academy of English is an English Language school centrally located on the beautiful island of Malta. We teach English to Adults, Teenagers and Young Learners at our centre, which forms part of St Catherine’s High School in Pembroke. Our school is located in a large brick building with sea and country views, set in private grounds. Every year we welcome International students to the island. Our innovative English Courses are very popular with all ages and after classes participants can explore the beautiful island of Malta in a safe, social environment! 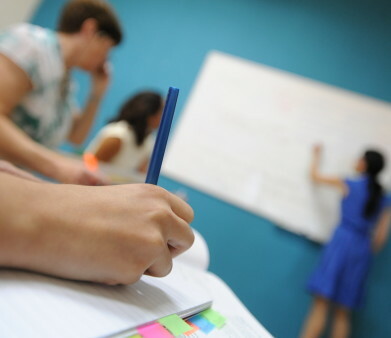 AClass Academy of English is well established as a leading course provider, having met the requirements laid out by the ELT Council and Government of Malta. You can count on us for a very warm welcome, personal service and excellent language tuition! The school environment is very peaceful. We have a study area, free Wi-Fi and computer lab and a small student library, where students can relax after class. The school canteen is also available for students to use during the school year. Classrooms are bright and airy, many with interactive whiteboards as well as air-conditioning in the warm summer months. AClass Academy can arrange host family accommodation, airport transfers, cultural tours and a unique experience for groups of students or individuals. Malta is a charming island to explore after your English course, please see our activities section for more details of after school events. We strive to achieve excellent language teaching with modern, communicative techniques and methods. You can choose from our range of English language courses – study in a group or one-to one. Whatever your goals we can help you to improve your English skills in Malta! Our courses focus on key skills; speaking, listening, reading and writing in English. Our learner centred approach means that you will communicate and use the language from the first day. The school offers General English or Intensive English courses for all ages as well as specialised packages for families. Browse our courses section online to see detailed descriptions of courses we offer ! Why choose AClass Academy ? This will help us get a better idea of your level of English so we can put you in the right class right away. Save time and money by booking our packages which include your English Course, Accommodation, Activities and Airport transfers!